Breaking news, skin fanatics! Dr. Perricone has a new line of products out called SUPER by Dr. Nicholas Perricone! 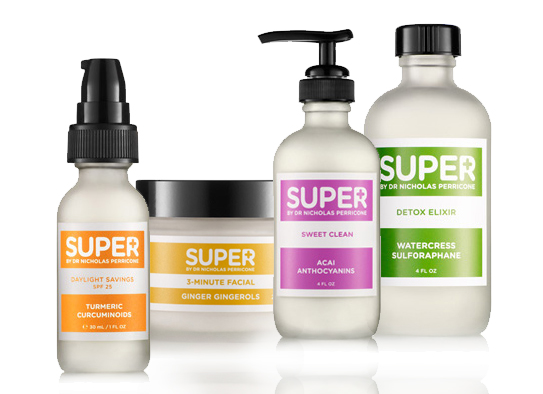 SUPER is a line of cleansers, toners, moisturizers, treatments & eye, lip & body products that make use of superfoods like ginger, olive, turmeric, apples, etc to impart a particular beauty benefit. Specific product lines are made to address acne, fine lines & wrinkles, lack of hydration, uneven skin tone, enlarged pores & sun damage. For instance, the amazing yogurt skin benefits of this Second Skin Hand & Cuticle Cream, "polishes and smoothes for soft and healthy skin." From a scientific point of view, yogurt contains Probiotics, which when in stable extract form, increase oxygen uptake and collagen synthesis for smooth, soft and healthy skin. Coconut is another superfood with moisturizing properties that "leaves skin soft and sweet". This Hyper Hydrator containing Coconut Water has medium chain trigylcerides benefits for quick absorption and a matte finish. Now, here's the best part! Yours truly and the folks behind Dr. Perricone are giving away any 1 (ONE) SUPER by Dr. Nicholas Perricone product OR Perricone MD product of your choice, valued at $150 or less! - Leave a comment on this post and tell me which Super by Dr. Nicholas Perricone/Perricone MD product valued at $150 or less you WANT or NEED, and WHY? - Don't forget to leave your Twitter ID and email address so I can contact you! I will be accepting entries until June 27, 2011. Winner will be announced on June 28, 2011. I would like to try the Cold Plasma as it sounds like a great all in one, anti-aging product. At 32, a lot of people told me I don't look my age but my eyes would be the clue because of fine lines and dark circles. If I get lucky I would like to have the Advanced Eye Area Therapy. I am from Seattle and you can never predict the weather here. I've been struggling to find the perfect skin moisturizer that would keep my skin hydrated for our unforgiving winter weather. I would like to try the Super Coconut Hyper Hydrator. Perricome MD High Potency Evening Repair is something I both want and need to prevent my skin from getting wrinkles and to heal sun damage from all the free days we spend on the ocean. I would like the face firming activator. I am always smiling and I have a few laugh lines. Thank you!!! I would like to try the Night Recharger to help brighten, smooth, and renew my aging skin. i want Perricone MD Cold Plasma! i want to prevent wrinkles! Hi! I want the Perricone MD Cold Plasma. My mom has been raving about this for so long after she read an article in a magazine. I would just LOVE to try Bright Eyed! My eyes get so puffy & it really sounds like this would be a great product! I want Dr. Perricone's Cold Plasma Eye because I've had dark undereye circles practically forever. I've tried just about every eye cream you can think of and I even took make-up classes yet I still can't make those dark circles disappear. They ruin my daily look and my daily life because they make me look old and tired. I'm a hands-on mom, entrepreneur, freelance writer, and blogger so I don't get much sleep. I wake up before 6am everyday and the earliest time I can sleep is past midnight. I just really need something for my dark circles. Oh I forgot my Twitter ID is @animetric. Thank you! I would love to get my hands on the Cold Plasma. I've been researching about this product for a while and have read good reviews. The only hindrance why I don't have it is that it's out of my budget. That's why this give-away is perfect for me! Cols Plasma sounds like it would be amazing! I literally look like Panda because of the dark circles around my eyes. And that is why I need the Perricone MD High potency Eye lift! Hi! I would like to try the Dr. Perricone MD Cold Plasma for the eyes because I've tried different eye creams to reduce the dark cirlces but still no good results. I hope this product will help me with my problem so I could toss my eyeglasses and just wear contact lenses. I'd love to get Cold Plasma because my mom and I can share it. I have hugs pores and my mom could do with anti-aging. 1. I follow you on Twitter as @calidreamin87. 2. I want the Superhero Body because I have really dry skin! 2 - I'd love to have the COLD PLASMA! Why? Because my skin's starting to give up on me! Oh gah, I have embarrasing large pores and discoloration all over. It would be nice to not have to worry about wearing make-up and have nice flawless skin. Nice to see Manila on the circuit with concise info on the benefits of yogurt in skincare products. Oh forgot to mention the Acai Super Clean is a for sure must have. The antioxidants are a skin saver and booster, please! I am visiting the Philippines - where can I buy Dr Perricone products in Manila?